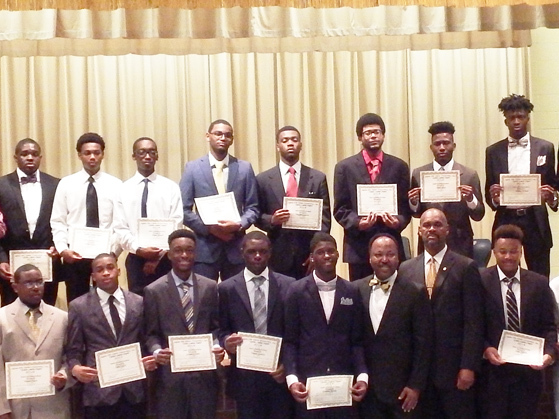 The Upsilon Lambda Chapter of Alpha Phi Alpha Fraternity, Inc. presented its annual Ezekiel Bryant High School Recognition program. 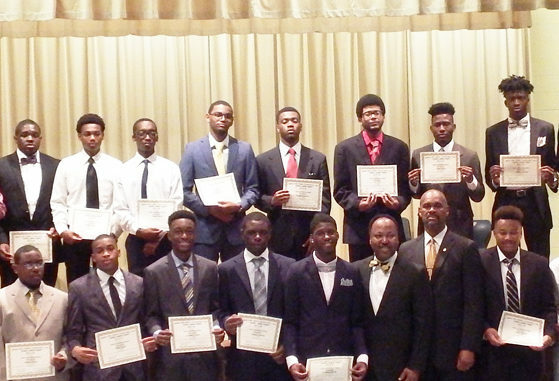 During the event celebrating scholastic excellence, the fraternity awarded Certificates of Achievement to 40 high school seniors from 13 high schools in Duval County with GPAs ranging from 3.2 to 3.9. Each student was formally introduced and recognized for their outstanding academic accomplishments. In addition, a panel of Alpha brothers in diverse professions provided them with college and career advice in law, medicine, information technology, government, engineering and nursing. Pictured above with the honorees (center, front row) are Chapter President James Kelly and Committee Chairman Calvin Burney, Sr. The seniors are students throughout the First Coast.